WASHINGTON (CNN) -- Eight firefighters and a gas employee were injured Thursday when a gas leak at a strip mall exploded in Forestville, Maryland, officials from the Prince Georges County Fire Department said. 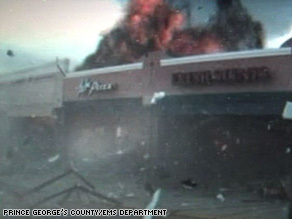 An explosion at a Maryland strip mall injured eight firefighters and a gas employee. Two of the firefighters were admitted to the burn unit at Washington Hospital Center and both were listed in fair condition Thursday night, Prince George's County Fire and EMS spokesman Mark Brady said. One of the firefighters sustained second-degree facial burns and injuries from flying debris, Brady said, while the other sustained chest injuries from flying debris. The others injured in the blast were treated and released, the officials said. The source of the ignition was not immediately determined, Brady said, adding, "we may never know exactly what happened due to the nature of the explosion." A caller alerted the fire department to the leak at around 12:30 p.m., Brady said. Shortly after the firefighters arrived at the evacuated building, the explosion occurred, he said. He estimated the blast caused $2.5 million in damage to six stores in the strip mall. At the time the leak was discovered, five stores were open. The fire department evacuated 45 employees and customers from the area just moments before the explosion, Brady said.